WELCOME TO THE LAKES REGION OF NEW HAMPSHIRE. One of the world's most exquisite settings of lake and mountain scenery awaits you when you visit the villages and backroads of the Lakes Region of New Hampshire. Shorefront towns of Weirs Beach, Meredith, Center Harbor, Moultonborough, Wolfeboro, Tuftonboro, Alton, Gilford, Holderness and Sandwich welcome you to a unique world of old-fashioned charm, friendly surroundings, and unsurpassed natural beauty. Endless lake and mountain vistas are accented with fun family attractions, special events, historic sites, outdoor adventures and unique shops in addition to friendly restaurants and a wide variety of comfortable accommodations. Spring fills the air with the perfume of lilacs and honeysuckle. In the lazy days of summer, Lake Winnipesaukee's crystal clear waters mirror luscious blue sky and lush lakeshore greenery. Summer in the Lakes Region is blissful, sunny days spent on the water, boat rides, and everything moving at a slow summer simmer. Summer may be the Lakes Region’s best-known season, but wrap the hillsides in spring green, the brilliant colors of fall or a thick blanket of snow, and it is every bit as magical. In autumn, the vibrant crimson of maples and golden yellows of birches is unforgettable. During winter, Lake Winnipesaukee becomes a wonderland, with easy access to ice fishing and miles of open area for cross country skiers and snowmobiles. No matter what time of year you visit, you're sure to discover the sights, sounds and fragrances which make the Lake Winnipesaukee and the surrounding Lakes Region unique. We welcome you! Please stop by our office and pick up lakes region information and speak with us personally about the lifestyle in the Lakes Region. The Lakes Region of New Hampshire is popular with tourists because its central location makes it a convenient base from which to see just about every section of the Granite State. It is popular, too, because of the many attractions in the region. There is so much beautiful scenery. Tourists rave about beautiful sunsets across a placid lake or distant views of the hills and mountains. There is so much to do that sometimes decision making is difficult. Swimming, fishing, and boating are an obvious attraction. 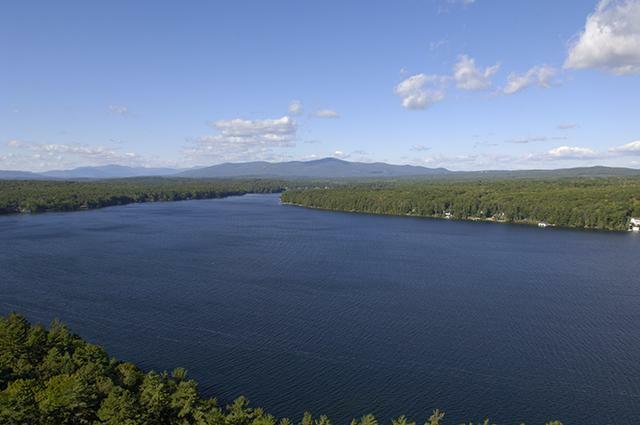 The most popular area is the "Big Lake", Lake Winnipesaukee, the center of marine activity in the area. There are smaller lakes, too, each with its own appeal and many camping areas right along the shore. There are beaches, museums, golf courses, historic homes, amusement parks, and shopping for antiques, plus outlet store bargains as well as gifts and souvenirs. Mountains with hiking trails nearby and it's not far to the seashore, either. There are summer theatres with dramatic shows or musical entertainment. Restaurants and nightclubs are located in several lake shore communities, some with gourmet reputations that keep folks coming back year after year. For those who like to cook in the RV or over a campfire the many farms in the area offer an opportunity to enjoy fresh from the garden fruits and vegetables at your site. Just exploring the area is an adventure. Back roads lead to delightful foothills, to woodland places to picnic or simply to a hillside with a spectaculiar view. Just walking on the village green in towns that have not changed much since colonial days is a way to relax. On a rainy day in the Lakes Region the number one activity is shopping. Tourists can visit malls filled with outlet stores or just travel the roads to find quaint shops and country stores. On warm, sunny days the beaches get the crowds. Others prefer quiet spots where they can listen to birds or just watch the clouds roll by. Whatever your preference, you're sure to find it in the Lakes Region. DISCOVER THE NEW HAMPSHIRE LAKES REGION! Whether you are a season visitor or just arrived, the New Hampshire Lakes Region offers something exciting for everyone. Nestled within the hills just South of the White Mountains, Lake Winnipesaukee and her sister lakes sparkle with the marvelous beauty the Granite State is known for. The lakes here are clean, some of the cleanest in the country, in fact. Swimming, boating, fishing and so many other good water activities ar an integral part of summer life in the lake region. Enjoy a day at the beach with a good book of take a exhilarating cruise on the lake. Likewise, the hiking, biking and exploring opportuniest in the hill and mountains are a paradise outdoors and nature enhusiasts cannot resist. Wander up Mount Major and witness a glorious sunrise over the lake and mountains. Who knows maybe you'll catch that elusive tropy fish or see that reclusive moose-the advanture is yours! For those who prefer something else, there is always a new trinket or an antique treasure to seek out. Wander through the unique shops of quint New England towns like North Conway or "Shop-till-you-drop" at the brand-name stores of the Tilton Outlets. For NASCAR fans, the New Hampshire Intermational Speedway is not far away. Choose from many professional golf courses nearby. Take the kids to Funspot, one the largest arcades in the US, or head out to the area waterslides or one of several mini-golf courses in the area. Spend an evening on the Boardwalk At Weirs Beach. There's something for everyone- the choice is yours!